For most of the second half they were dead in the water. Fans were already looking forward to Sunday’s game against Iowa. But somehow, the Ohio State Buckeyes almost found a way. 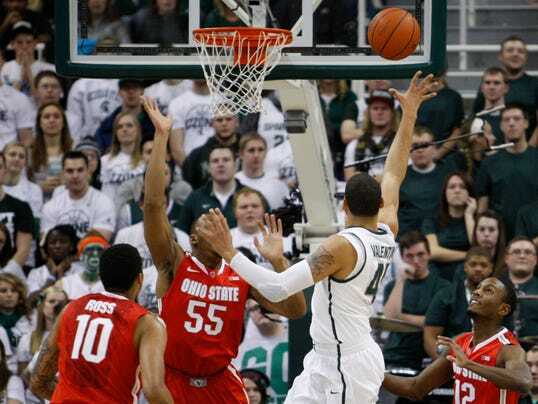 Overcoming a 17-point deficit with seven minutes left, the Buckeyes forced overtime and nearly pulled off a stunning win over Michigan State on Tuesday, losing 72-68, at the Breslin Center. Trailing 55-38 Ohio State turned up the pressure defensively and went on a 20-3 run, forcing turnover after turnover while finally getting hot offensively. One of the key plays was when Craft through an inbound pass off Payne’s backside and made an easy layup to cut the lead to one. Ohio State actually had a chance to win at the end of regulation but a Shannon Scott layup rimmed out at the buzzer. In the overtime Ohio State took it’s first lead since late in the first half when Sam “Slam” Thompson made two of three from the free-throw line, but Michigan State built a lead on 3-pointers from Kenny Kaminski and Payne. That lead quickly disappeared when Thompson hit a clutch 3-pointer with 1:13 left. But Keith Appling hit a 3-pointer a s the shot clock wound down with 34 seconds left and OSU could not complete an overtime comeback. Amazingly enough, OSU made the furious finish with Lenzelle Smith Jr., on the bench and Coach Thad Matta riding the hot hands of Thompson and Marc Loving. Thompson finished with a team-high 18 points while Loving added 13. Aaron Craft and Scott each scored 9 for OSU. Appling led the Spartans (14-1, 3-0) with 20 points while Payne added 18 and Gary Harris 13. Ohio State (15-1, 2-1) shot .414 for the game including .222 from 3-point territory and .667 from the free throw line. The Buckeyes committed 21 turnovers which helped the Spartans win at home against OSU for the second-straight season after losing the two previous. Ohio State was sloppy at the end of the first half and into the early part of the second to dig itself a hole that seemed too big. Down seven at halftime, OSU saw the deficit grow to 10 and the Buckeyes trailed 35-27 at the first TV timeout. A dunk and free throw by Amir Williams cut it to 35-30 but Payne, who didn’t start and was iffy due to a foot injury, made a jumper for a 37-30 lead. Scott cut it to 37-32 with a layup and OSU got the ball back on a Payne turnover, but an offensive foul on Trey McDonald gave MSU the ball back and Denzel Valentine nailed a 3-pointer and Appling made a layup on a Scott turnover to make it a 10-point game again with 12:36 left. OSU called a timeout, but it didn’t help. Michigan State went on a 8-2 run to open a 50-34 lead. OSU was able to cut the deficit to six with about three minutes left on a pair of Thompson baskets and a dunk and a Loving jumper but, Brandon Dawson made a layup to kick the lead back up to eight before Ohio State made it’s final run to force OT. The Buckeyes fell behind early in the first half as the Spartans made a couple of quick 3-point shots. Michigan State led 10-5 with 13:45 left in the half, but the Buckeyes went on a 9-1 run to take a 14-11 lead with 9:27 left. Ohio State took a 12-11 lead on a jumper by McDonald midway through and then Thompson made a jumper to give OSU a 3-point lead. MSU then went on a 17-7 run, including nine straight to end the half, and led 28-21 at halftime. Ohio State made just 9 of 27 shots including 2 of 9 from 3-point range. The Spartans weren’t much better overall, shooting 11 of 29. But they hit 5 of 10 from long range and forced OSU into 10 turnovers. MSU coach Tom Izzo wasn’t happy with the officiating. So what else is new? Coming off the court an ESPN reporter asked Izzo what he was so upset at. Ohio State hosts Iowa at 1:30 on Sunday in a game on CBS.